The year of 1983 really proved to be a horrible year at the Nowruz Oil Field. There were several different incidents that resulted in oil being spilled into the Persian Gulf. All of these incidents occurred during the height of the Iran-Iraq War. During the war, an oil tanker collided into an oil platform in the Persian Gulf. The power and force of the collision caused the platform to fall into a 45 degree angle-position. Waves and daily corrosion eventually caused the riser to fall into the wellhead. This of course caused heavy damage and for months, the well leaked 1,500 barrels of oil each day. 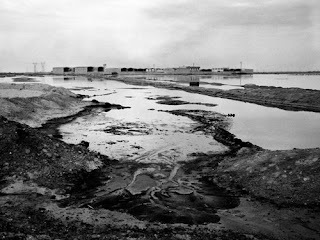 Even though many planned efforts to stop the leakage were put into place, capping the well was seen as too dangerous because Iraqi planes were constantly attacking the platform. Before this first incident was resolved, there were more oil spills. For example, in March 1983, Iraqi helicopters attacked a platform in the Nowruz Oil Field. During this incident alone, over 733,000 barrels of oil were spilled. The spill was finally stopped and capped in May 1983, but only after 9 people died in the attempt to cap the well. The first Nowruz incident was not solved until September 1983- 11 men had died during attempts to stop the leak.